Now that we’re heading into mid-August (wow, already?!?! ), I’ve begun to reflect back on what dishes I’ve made so far this summer and taking note of what I still need to do. There are so many options…it’s sometimes hard to decide what to make each night. Frank is a huge clam lover and one day, while we were down the shore, he was seriously craving them. My mother-in-law had been talking about doing a boil for a while. So, we combined the two wishes and crossed off one of those dishes I thought of from my to-do list. Although there are several steps to making a boil, there’s no reason to be intimidated. All of them are easy, and the end result is well worth it. It’s also easy to add, substitute or omit items…just make sure you keep the timing just right so you aren’t overcooking any ingredients. Also, we cooked this in 2 separate pots (two 8 quart ones) because we didn’t have a larger one. Worked just fine. So don’t let that scare you off, either. Don’t forget the ice cold beer. It’s a must. Oh, and some crusty bread as well. It’s a fun one to get down and dirty with! Heat oil in 12-quart stockpot on medium heat. Add garlic; cook gently 2 minutes without browning. Add chicken broth, crushed tomatoes, 3 tablespoons Old Bay and pepper. Bring to boil. Stir in potatoes. Return to boil. Cook, covered, for 5 minutes. Add onions and sausage. Cook, covered, for 5 minutes. Add corn and clams. (If ingredients are not covered by broth, add up to 2 cups water to cover.) Cook, covered, 10 minutes or until clams open and corn is tender, stirring occasionally. Add shrimp. Return to boil, stirring gently. Cover. Remove from heat. Let stand 5 to 8 minutes or just until shrimp turn pink. Drain cooking liquid. Pour contents of pot into large serving bowl or platter. Sprinkle with remaining 1 tablespoon Old Bay. Serve with lemon wedges. 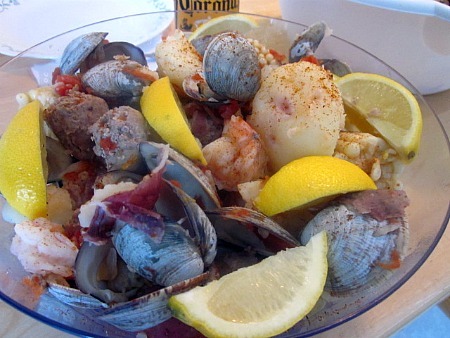 This entry was posted in clams, corn, main dishes, potatoes, seafood, shrimp. Bookmark the permalink. I seriously wish we had fresh seafood around here. I went to the store and there is even a note on the case: fish have been frozen for transport. Oh well — a foodie can dream. Love the colors in this dish, I am sure it tastes as good as it looks.